This project was created on 11/06/2018 and last updated 5 months ago. This project showcases the next iteration of that model car. Most notably, the motor was swapped from brushed to BLDC and a custom motor driver is employed. As before, a Raspberry Pi is tasked with generation of the video feed and communications. In addition, it now controls the servos directly rather than through an additional micro controller. The latter is now a dedicated motor controller. Last but not least I improvised covers to protect the electronics from moisture, so the vehicle could drive outdoors. As before, this project is about making a "drone-like" model car which gives the operator a video feed, some telemetry, and which communicates with a single digital radio. At the heart of it is a Raspberry Pi 3. It deals with messaging through the Wifi interface, controlling servos, and communicating with the motor controller, to name the most important tasks. Illustrated in the following diagram. Red represents power supply, black lines data flow, and yellowish major components. The box labeled Custom "Shield" is a circuit board which sits on the 40 pin header of the Pi and bears the indicated components. Besides the obvious, there is a status LED which blinks differently depending on the state of the operating system - shut down, rc car processes running, or processes not running. The "shutdown" button triggers shutdown of the OS, as the name implies. With IMU I refer to a AltIMU-10 v4 board from Pololu. I added it for the possibility to present the heading, or some sort of attitude indicator to the user. 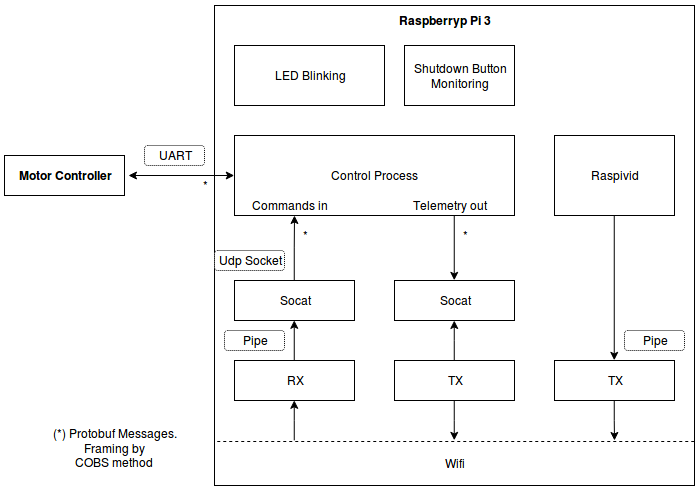 The next diagram shows the processes running on the Pi. There is a central Python script, here named Control Process, which handles messaging and servo control. You read that right, Python. However, the speed with which it could be developed made it worthwhile to write rather than going straight for a C++ implementation. Fortunately it runs fast enough. RX and TX refer to the processes pertaining to the wifibroadcast software. They use stdin/stdout to exchange data. However, I find it convenient to launch them independently of the other processes. Other processes should just be able to connect to them when both parts are available. I enabled this by connecting RX/TX to socat which opens sockets other processes can connect to. Raspivid, on the other hand, streams directly through stdout/stdin to TX since this part of the system is very simple and stable - at least from my user perspective. So no need to control these two independently. All the processes are managed by systemd - much like in the basic wifibroadcast project. There is a service file for each of them. A custom .target file helps to bring everything up automatically in a well defined order. Details on essential and/or changed components follow. BLDC motors are considered better than brushed variants. Higher efficiency, less wear, for instance. So it would be nice to be state of the art. They can come with integrated position encoders. This is useful again for several reasons. For one because speed measurement and control is desired. My attempts to retrofit the motor I already had largely failed. Also the motor has to fit the chassis and BLDC motors designed for toy cars do. I&apos;m interested in power electronics and embedded programming. Therefore I wanted to attempt to design a custom motor driver. The controller got a project site of its own. I refer there for details. 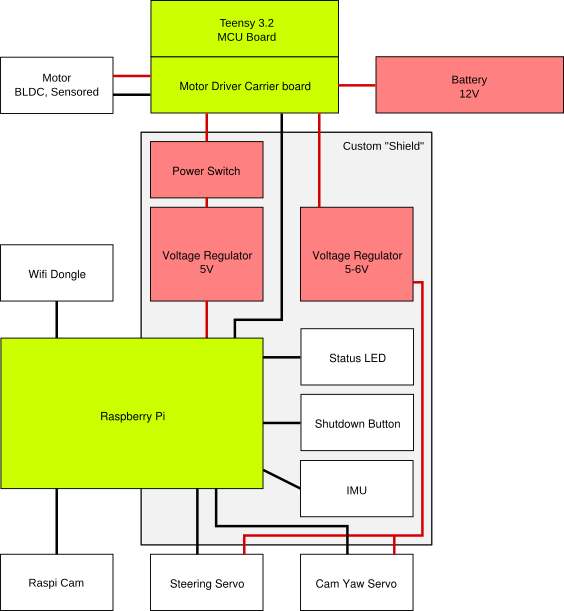 A Teensy based controller board to control a number of motors, plus DMX, RS232 and GPIO. TKIRV is an attempt to build a land vehicle that can operate indefinitely while being remotely controlled over the mobile network. You are about to report the project "YaRC Vehicle V4", please tell us the reason.